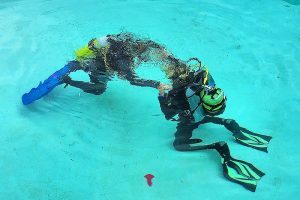 This course is open to any certified diver who feels they need or want a refresher. Our PADI instructors will get you in the water having fun and feeling comfortable again. It’s quick and easy, and a good way to get you in primed for your diving vacation or before you embark on your next PADI course. Day One: You will meet with your instructor to complete your paperwork and review your diving history. Then you’ll spend a some time brush up on your knowledge and reviewing skills on land, before heading into the shallow ocean water in front of the dive resort for some in-water skill review. Once comfortable, you and your instructor will head out for a shore dive on our beautiful house reef. Classroom time to review skills and knowledge. In-water skill review in shallow ocean water. One open water shore dive with your instructor.